The subwoofer Alcone Sub 10 ASW-3 is an interesting addition to any medium or small satellite. Sized 48 x 38 x 38 cm (HxWxD) the sub contains an Alcone AC 10 HE with aluminium cone and the subwoofer module Mivoc AM 80, delivering 80 Watt continuous and 140 Watt programme into 4 Ohm. The Sub 10 with the bigger amplifier module (no longer produced) was reviewed in Klang+Ton long time ago (3/98). The magazine's description: "The Alcone Subwoofer Sub 10 combines absolutely precise and deep bass with an enormous power handling. This sub has got what it takes to become a classic." The picture to the left shows the frequency response with infinitely variable cut-off frequency, adjustable at the subwoofer module; the blue line indicates the frequency response at 100 Hz cut-off frequency, the red one at 60 Hz. Due to its excellent price / performance ratio the AM 80 is certainly one of our very interesting amplifier modules. It's a grown-up and capable amplifier delivering 80 Watt continuous / 140 Watt programme into 4 Ohm. That's it! 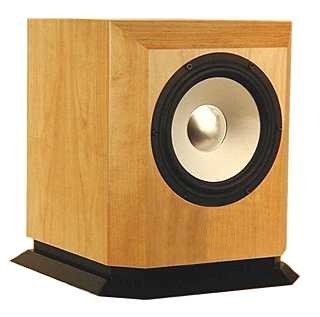 Should you want to release your speakers of the duty to produce low bass - that's were a subwoofer is at its best - then they should be connected to the low level RCA connectors. 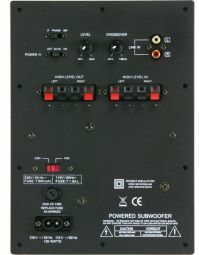 Otherwise, there are five different, additional ways to connect your amplifier to the module. Please contact us if you need help.